Until quite recently attics were used only to store unnecessary things. Today they are converted into cozy and bright attics, the advantages of which were appreciated by many. 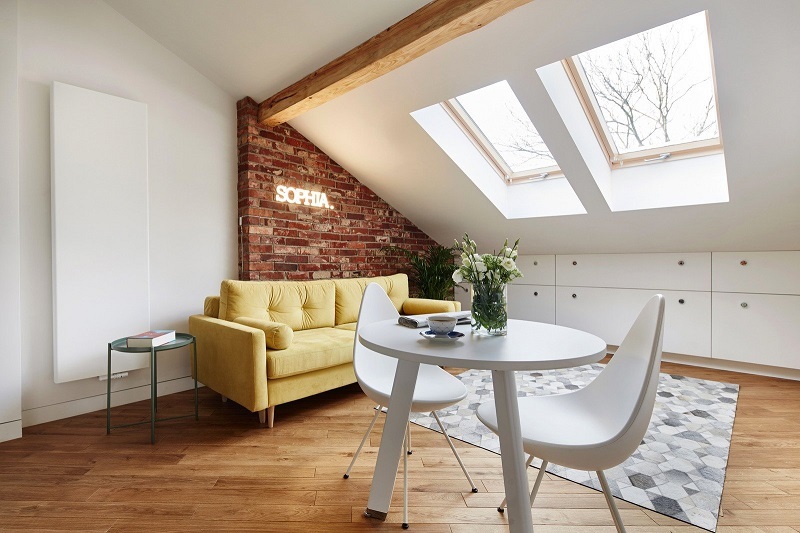 But the non-standard constructive solution of the apartment space on the attic floor requires compliance with certain rules for decorating the interior. Today we will talk more about them. Apartments on the attic floor are found in many houses. These are quite complex spaces for designing and decorating. In them non-standard windows, low ceilings in places where the roof goes to the ramp, the indirect corners. Often, several roof skates converge at one point in the ceiling. But in a good house with a beautiful view from a window located in a convenient location, all these shortcomings are compensated by a competent layout and design. How to choose an apartment? If you are going to buy an apartment on the attic floor, do not forget to check whether it is transferred to a housing fund. In contrast to Europe, where all lofts and cellars are usually considered residential, this will create difficulties. Also, pay attention to the windows. Often in the attic, they go to the roof, that is, are outside the level of visibility. It should be preferred to those apartments where the windows are located at an acceptable height – so that the angle of the ramp would allow you to go to the window and it was not over your head. In some countries, it is allowed to cut additional roof skylights. But sometimes there are problems with this. You can be offered a spacious apartment with insufficient lighting and advise to eliminate this problem most later. In these cases, we recommend that you increase existing windows by dragging them down. Also, pay attention to the height of the ceiling and the angle of the ramp. If the latter is too sharp, part of the room may remain darkened and uncomfortable for use. What cannot be done in the attic apartments? 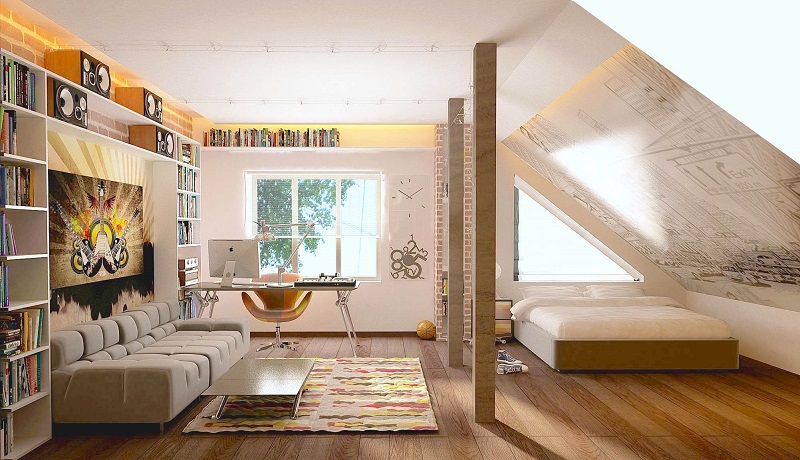 When planning to split the complex space of attics into small rooms. You can not create blind corridors, transitions, separate small rooms. A large number of partitions will turn the room into a dark and uncomfortable. Use stucco because of the complex ceiling architecture. To glue all rooms with wallpaper, as their drawing is difficult to place correctly. Wallpaper and panels, in this case, can be used in the English interiors of the attic. To paint in bright colors a ceiling and walls will complicate a premise and will make it less comfortable. The mansard room is recommended to decorate only in light colors. Use bulky furniture. Heavy stylized objects will not look in a room with low walls and beveled ceilings. They require only the right forms. To hang lambrequins or even ordinary curtains – they will hang ugly downwards because of the windows located at an angle. All additional decors prevent the doors from moving freely. For the design of floors use heavy tiles. Replace it with light parquet. To balance the complexity of the room, when designing, you need to be guided by the principles of minimalism. That is, everything that makes the space uniform, like a part of the house, is appropriate. In apartments with low ceilings, partitions should not be brought to the ceiling – they should not interfere with lighting because of the non-standard arrangement of windows. You can replace the upper part of the partitions with glass inserts, and then the sunlight will fall into all the rooms. Another case is a two-level apartment. 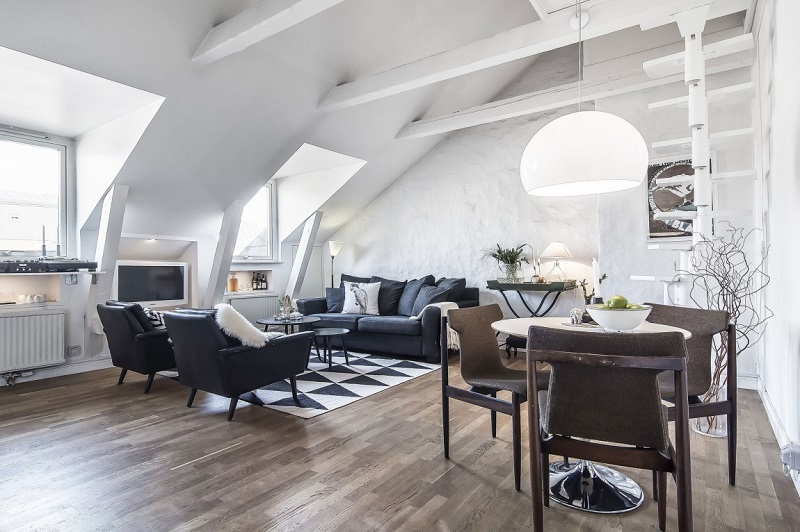 Unlike conventional mansard rooms, where the ceiling is almost at an acute angle connected to the floor, their walls have the usual height, and the ceiling converges in the middle. At the location of the horse, the apartment has the maximum height. Such a room is usually divided into two levels: a bedroom is placed on top, and a living room and an office are at the bottom. The rest of the layout can be free. It is possible to unite the zones of living rooms, canteens, offices, allocating only a large bedroom, bathrooms and kitchen. To ensure that all rooms are lit, you can use glass partitions to separate the top floor or not extend the floors to the end. The roof ridge is always left open. Well, if the apartment will look like a fairly spacious workshop. It is enough for one bathroom, one dressing room and a small passage. The kitchen can be placed in an inconspicuous part of the room. Walls and ceilings are better designed in one color and material – this will help visually increase the height of the room. Low walls and overhanging roof slope will not so “press” on a person. Most often, the walls and ceiling are painted in white or in light gray tones. To enhance the effect, you can increase the windows. Other complications of the premises will be superfluous. In addition, do not align the wrong corners. This is the main feature of the mansard room, which cannot be disposed of. For the design of attic floor will suit parquet with a laconic graphic pattern. Due to the unevenness of the corners of the room, its styling can be difficult, so in each specific case, it is better to contact designers. They can offer a simple single variant of laying a parquet or split it into parts in each room. Particular attention should be given to the drawing and its direction. The best solution in this case – the French styling herringbone. In the attics, everything that facilitates the architecture of space is appropriate: internal windows, low partitions with transoms, glass doors, and low furniture. They make the room comfortable and comfortable. How To Choose Furniture And Curtains? Mansard rooms are not high. Furniture for them must be chosen appropriate – light, low and concise, modern and without extra styling. You can install several antiques – a buffet, table or chair. Also, a modern sofa or chairs on thin black legs. All items should be placed fairly spacious and not pressed against the walls. It is better to form separate groups: around the dining table, sofa and armchair. Upholstery furniture should be as light as possible: white, light gray or pleasant pastel tones. Windows should be covered from bright light with wooden blinds or curtains. It is better to choose Roman curtains, which stretch on the window itself and do not sag. Graphic lines will look good in the bright space of the attic floor. It can be ceiling beams, which should not be painted in a contrasting color. Let them remain white, gray. The graphics can be created and dormer windows, if they are separated by frames. If space seems too homogeneous, then the graphics can be added using furniture on black legs, drawings on carpets, paintings, paintings, geometric prints (cages or stripes) on pillows, rugs, furniture upholstery.